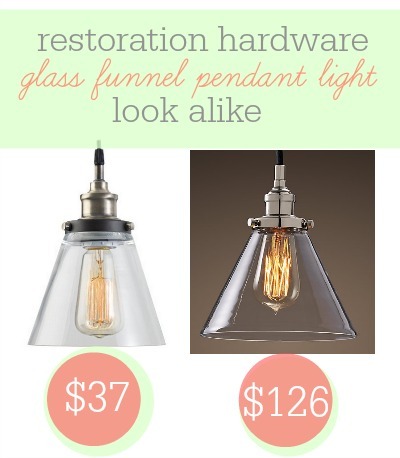 Once again, I looked to Amazon to find a look alike for a Restoration Hardware Factory Filament Glass Funnel Pendant. This simple pendant light with a glass shade costs more than $120 at Restoration Hardware, but it was a breath of fresh air to find it for $37 on Amazon. These would look great over a kitchen island or over the sink. See more Frugal Look Alikes.